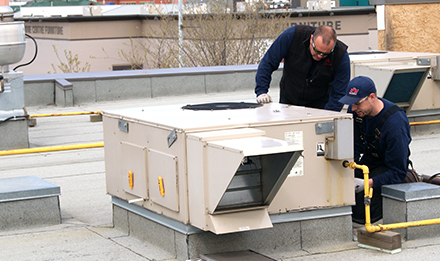 At LSM Service Division Ltd, we specialize in servicing HVAC equipment for commercial buildings, industrial facilities, institutional buildings and oilfield facilities. We work hard to provide extremely high-quality service and to never keep you waiting. As Grande Prairie’s biggest HVAC service company, we have planned service agreements in place with over 200 companies. We create a specific contract with each customer that sets out a schedule for regular maintenance on their equipment. The company values are its people, its customers and our community. 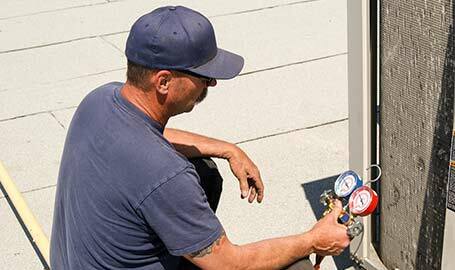 We strive to ensure all customers are completely satisfied with any and all work we complete. We also recognize the importance of family and foster a supportive, compassionate and flexible work place to ensure our employees have the ability to have time with their family and friends. We support our employees to contribute to our community in a positive way as they see fit. LSM Service Division Ltd. was founded in 1964 as an entity of Lee’s Sheet Metal until 2008. The focus and priority at that time was to offer the startup and verification of the installations of Lee’s Sheet Metal, installation of the air conditioning equipment for Lee’s Sheet Metal and also to serve the needs and service requirements of the community of both residential and commercial HVAC. In 2008 LSM Service Division became a separate entity and is now completely self-reliant from an operations standpoint. The commercial and industrial HVAC service demand was such that residential service was negotiated to become a service provided by the Lee’s Sheet Metal residential Home Comfort Solutions department. Today Pete Merlo and Dale Sheridan are still the majority shareholders of LSM Service Division but the company has offered share purchasing to employees over the last eight years with the mindset that employee-owned companies are stronger companies. We have nearly 20 staff and 15 fully stocked 4×4 service trucks. We have the ability to offer the fastest response time for your emergency repairs as we have the most technicians in the area solely dedicated to service and repair. LSM Service Division is fully committed to our customers and community. We dedicate ourselves to being strong members and supporters of our community and especially our local group’s most vulnerable people. As a company, we dedicate safety as a top priority in any and all work we do to ensure the safety of our employees, our customers, our community and our environment. We complete each service call and service visit with high quality, consistent workmanship, dedication and customer care. We always make it right for the customer regardless of the circumstance. LSM Service Division has a very high employee retention rate and we also average a more than 98% customer retention rate. We focus on equal opportunity for all employees and work as a team to ensure all our customers receive the service they have come to expect from us. Supporting our community, whether our local region or global community, is a responsibility LSM Service Division takes seriously. In order to have a strong, healthy community it’s important to give back to the people and groups that support you. It’s also for the camaraderie. We work as a team to be good to our community and its strengthens us as a company. Here are some of the community activities we are currently involved in. LSM Services Division gets together each year with the LSM Group to raise money for the United Way. We organize voluntary payroll deductions, we hold barbecues, 50-50 draws, silent auctions – whatever creative ideas we have to bring people together for a great cause. Our aim: to bring people together and raise as much money and awareness as possible each year for the United Way. We have been doing this since 1991. Our field supervisor, Mike Banman, has been volunteering for Canadian Humanitarian in Ethiopia since 2012. Mike adopted two little girls from Ethiopia in 2007 and 2012 and has been raising money for volunteer missions there ever since his second trip. Canadian Humanitarian works with at-risk children in several cities in Ethiopia, providing education centres, medical services, support for post-seconday education, as well as meals for the kids. LSM as a company supports Mike’s work in Ethiopia and our team members often donate to him personally as well. We have sponsored Team Rossing, a local Grande Prairie women’s curling team, since 2010. The team has been doing great and we’re proud to watch them grow.